Spacious and shady pitches for tents, caravans and motorhomes. 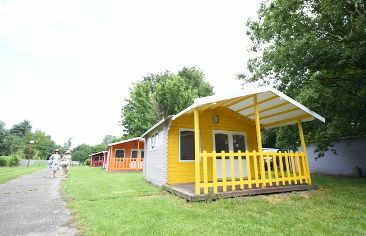 Our mobile homes are practical and comfortable. The perfect spot for family vacations ! For a pleasant stay, simple and close to nature. Installed in a cozy and privileged setting – 5ha of greenery between the Rhône to the Rhin canal and the Ill river. Our family campsite offers you for your vacation or during a weekend the rental of comfortable and cozy mobile-homes and cabins. Enjoy a night in one of our unusual accommodations - pods, magical cabin, igloo or if you are more into the authenticity of a traditional campsite, camping pitch to install your tent, install the awning of your caravan or park your camping-car ! Welcoming and smiling, our team answers to your request to satisfy you the best way possible. 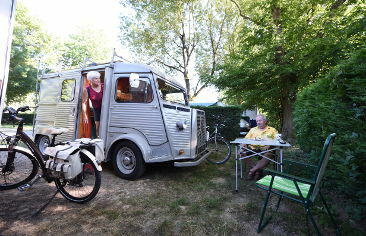 Discover the wide range of practical and useful services offered by the Camping de l'Ill to its holidaymakers. 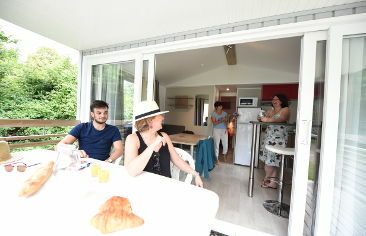 Catering, bread, library, shop, rentals and loan ... Do not look any more, everything is here to make your life easier and allow you to spend a pleasant stay at the campsite in Alsace. Laure, Lysiane and Alexandre welcome you all day long at the reception desk of the Camping de l’Ill. Our friendly team is here to help you settle in and guide you through the discovery of the region of Mulhouse. During the evening, some food-trucks are here to make you taste and enjoy some nice meal without even going out ! Come and taste specialties from our region or eat more traditional cuisine according to the evening. You will find in our shop souvenirs of the region some local culinary specialties, guides on Mulhouse and its region and cycling map. You will also be able to buy wine from our Alsatian winemakers, to consume with moderation of course! To ease your stay we offer rental of sheets, barbecue grill, adapters or « baby kit »: crib, high chair and bath. Also find ping-pong rackets, balloons, board games, books and pool games on loan at the reception of the campsite. With its swimming pool, funny and sporty activities as well as the many leisure facilities nearby. You will always find something to occupy you during your stay at Camping de l’Ill. Spend, have fun or relax is everything that we have planned for you ! The Camping de l’Ill has a swimming pool which you will certainly enjoy during your stay. It also has a paddling area so that the little ones can also dabble in the water to cool off. Children are not left and forgotten at the Camping de l’Ill ! In the middle of the greenery, a playground with slide, carousel and animals on spring awaits them. What to have fun all day long ! The stage 6 from the Tour de France will start in the city of Mulhouse. Live this event at the Camping de l’Ill!